I walked out the back door and circled around toward the front of the house one recent Saturday morning, looking for the shovel. I suspected it had been left leaning against the porch after a recent gardening project. A few weeks earlier, we had pulled out yet another dying shrub and planted a few annuals. The annuals – mostly Zinnias and Sunflowers sown from seed – sprouted and grew about an inch tall, then disappeared. We figured someone ate them, most likely a rabbit. I was hunting for the shovel so I could plant some things in another flower bed, this one beside the Little House. I walked down our paved driveway toward the road and noticed the yellow metal flag on our mailbox across the street was standing at full salute. I saw no sign of the shovel along the porch and continued toward the road, aiming to fetch the now day-old mail. 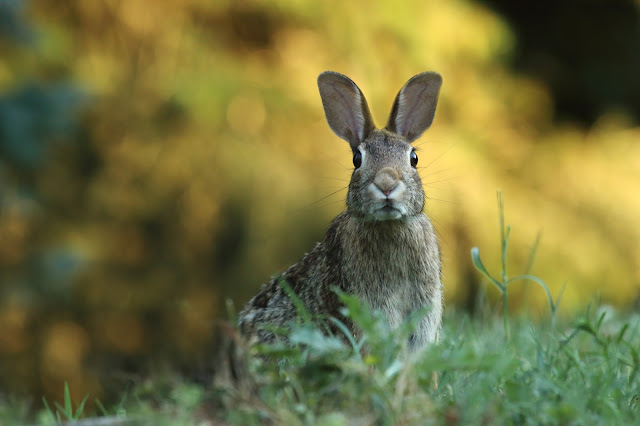 Along the shoulder of the road, just in front of the mail box, sat a large, speckled hare. I figured it would run off as I crossed the road. The rabbit stayed still, though, as I approached. Beyond the mail box, the gravel and grass gives way to a giant field of feed corn, a tide of green that rises slowly each day. I stopped, just beside the rabbit, my sandal-ed feet pausing in the small strip where grass and gravel collide. The rabbit's eyes bulged. They were enormous, not right at all for a hare its size, and its breath came in short heavy pants. The fur along one side of its body was rumpled and I leaned down to look for injuries. I couldn’t see any blood, so I reached down with my right hand to feel the rabbit’s back. Its speckled fur was coarse and dense. I gently pushed the rabbit toward one side, then another, looking, again, for injuries. I wondered at its bulging eyes, were they rimmed with blood? Observing the hare, with its unknown injuries, I felt a familiar weight of responsibility descend. I considered picking it up and carrying it to the house. It would likely die before long, but I hated to think of it struggling through its last hours on the side of the road with the sun beating down. Also, there was our dog to consider, and the cat – I didn’t want them crossing the busy road to catch it. I turned to the mailbox, pulled out our mail, and locked down the bright yellow flag. I noted a pale blue envelope – real mail, not junk – wrapped in the day's advertisements and crossed the street, heading back to the house. I decided to get a towel to carry the rabbit. Once it was safely inside, I'd ask my husband to take a look at it. Walking toward the house, I reflected on the foolishness of nursing a hare to health. I, who routinely stands along the fence kvetching with our neighbors about the havoc rabbits wreak in gardens and flower beds. I remembered the plush Angora rabbits I recently petted at my friend’s farm, their dense cashmere-like coats so different from this wild hare’s hide. Mostly, I hoped the kids wouldn't catch wind of the rabbit before I could decide what to do with it. It was the first morning, in over a week, that all six of us were home together. To celebrate, I had gone to the grocery store after work the night before to buy Buttermilk, intent on wowing us all with a new pancake recipe. I envisioned a delicious, family breakfast, but the recipe was a flop and I gave up on the lumpy bowl of batter after producing a few half-cooked pancakes with a texture like silly-putty. My husband, John, was in the hot kitchen trying to salvage my mess. I found him there and lured him outside to explain the rabbit situation. Armed with a beach towel, and fully prepared for a rescue operation, I led him across the road. The rabbit was still there, but had moved a little, turned toward the field of corn. John guessed, by the way it moved, that its foot was broken. He also commented on the bulging eyes. “Can rabbits get rabies?” he asked. He didn’t want to touch it. I mentioned I already had. I bent down, then, to look at its face and saw that its nose was bloodied and raw. “Its face is bleeding,” I said. “I don’t think it’s going to make it,” he said. I hated the thought of whacking it over the head, but I hated the thought of its slow, confused, demise even more. “Do you think you could break its neck?” I asked, thinking of the young rooster we recently dispatched. “I can’t find the shovel,” I said as we crossed the road together. It seemed we had come full circle. Afterwards, I stood in the disastrously dirty kitchen, leaning against the counter, and opened the pale blue envelope. It held a card with a small pile of cash tucked inside along with the signatures of three dear friends. They had asked, a few weeks earlier, whether we would accept a little money to help us do something fun with the kids this summer. "His ear fulls up with breathing. The rain will never stop falling." Nye's poem gets at the heart of what I was doing that Saturday, what my friends were doing through their inquiries and gift. We were each crossing the street, pondering how another's need might intersect with the abundance of our own lives. It's not like I heard the hum of the rabbit's dream deep inside me, but I did hear the hum of a deeper truth. All of the many roads that divide us are nothing compared to the impulses of Love and Compassion that bind us all together. Kelly, your words are always a cold drink on a hot day, that bring me to tears in the process. "All of the many roads that divide us are nothing compared to the impulses of Love and Compassion that bind us all together." A gentle reflection upon a hard bit of reality and a moment of soft encouragement. Thank you for your work leading me and others to reflect well upon our lives. Mail Worth Crossing the Road For . . .